I am trying something new today. 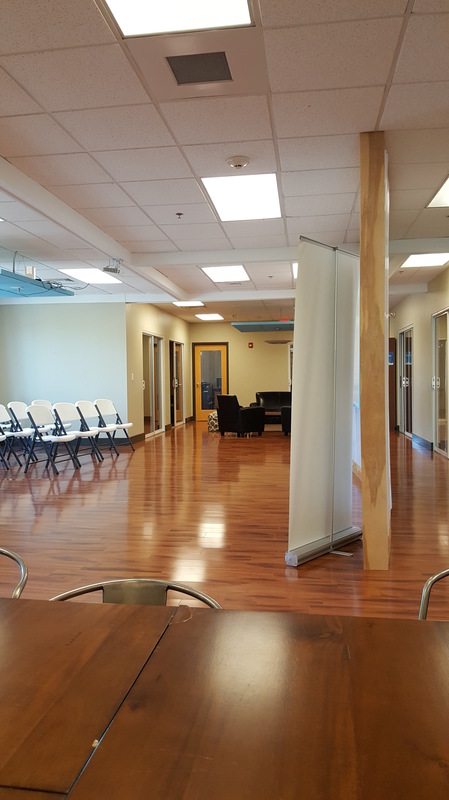 It is Small Business Week, and the local business incubator is offering free co-working space this week. It’s an alternative to working from my office at home. Theoretically, it offers an energetic vibe and some stimulation because of the various other people present working on their own thing. Theoretically. Because except for two people in the conference room with a closed door, and one in an office with a closed door, the place is as empty as a lot of courthouses on a Friday afternoon. I’m it. The idea is appealing, and I’ve been thinking and exploring this concept for over a month. It’s nice to have a 30-second commute at home, in jammies if desired, but there is a “real thing” aspect if you go to an office outside the home. Even though it doesn’t offer the company I expected, I have already learned a few things. First, I brought my old laptop, because the newer one is fairly large and heavy compared to this one. I forgot my mouse, so am having to use the touchpad. Lesson 1, like packing to go on a trip, don’t skimp on what you bring along, especially if it will help you be productive. Second, expectations don’t need to be high or low. Instead, just keep an open mind. It’s actually aesthetically pleasing here, although a bit contemporary for my taste. I read somewhere recently that creativity is sparked by trying something new – whether it’s a new place, a new view in an old place, a different route taken, a new food, etc. On the way here today, I came the back way, and it was nice and refreshing, driving through residential areas with tree-lined roads instead of taking the fast highway. Third, it took a while for this computer to boot up. Instead of zipping right to the last-saved place, I had to log in and saw a Dashboard screen I don’t usually see unless I seek it out. Interesting factoid: I have published 100 posts; this is 101. As I scrolled through the archive, I smiled to myself to remember what this or that post was about. Likewise, I am pleased to recognize the forward progress and occasional momentum I have gained on this journey. I have changed, no doubt about it. One hundred is a milestone of sorts. Our president has been in office 100 days, and there is a bit of news surrounding that. I recently noted I hadn’t ridden my motorcycle “even 100” miles last year. I had a garage sale last weekend, and the $100 bills I have set aside….and I took a few $5’s and $10’s to spend. One hundred degrees for summer temperature is not far off, and there is no dispute that that is HOT no matter where you are. One hundred one is a new start, a rollover-and-reset for the counter, a next level begun. I’m there. I didn’t know it would be now; I didn’t even see it coming … didn’t set my sights on it at all. It happened. As life does. It goes on. Here I go!